When he created the Standard Oil trust at just thirty-one years of age, he had one mission regarding the fragmented oil industry in the United States: combine everything under the Standard Oil umbrella. To accomplish this goal, Rockefeller did one of two things: he either gobbled up his competitors in exchange for some freshly issued Standard Oil stock, or he would be willing to sustain a temporary loss to himself to drive his competitors out of business. What Rockefeller would do is this: he would set up a profit sharing arrangement that would allow him to ship his oil for only a dime, and he would give the families of the freight operators 100 lot blocks of Standard Oil stocks. The other competitors would have to pay $0.35-$0.50 to ship their freight, and with ease, Rockefeller was able to use this cost differential to drive his competitors to the brink of bankruptcy (although they would usually sell out to Rockefeller before reaching that point). Rockefeller’s unrelenting focus on global dominance of the oil industry meant that he truly took no prisoners, even when it came to his own family members. First, I want to give you a little bit of context. John Rockefeller probably had the most schizophrenic (for lack of a better term) upbringing of any capitalist I have ever studied. The morals of his parents, and the lessons that they tried to impart in the mind of a young Johnny Rockefeller, could not have been more different. John Rockefeller’s dad was a mean son of a gun. When a young Jonny was making money as a schoolchild, his dad would ask to borrow the money, promising to pay 15% interest. After Johnny gave his dad the money, Papa Rockefeller would spend it all and laugh at the thought of repaying his son, telling a young Johnny that he needed to toughen up if he wanted to “make it in this world.” Traces of Papa Rockefeller’s morals could be seen in the ruthlessness with which John sought to eliminate the competition and fight with the other capitalists of his day, most notably J.P. Morgan. Rockefeller’s mother, meanwhile, was the exact opposite of his father. If she were Catholic, she would have been a saint. As she saw a young John Rockefeller rise to power right before her very eyes, she would seek to reinforce the virtues of “keeping your word” and “never forgetting where you came from.” Traces of Mama Rockefeller could be seen in John Rockefeller’s actions later in life as well. Most notably, even as his Standard Oil fortune grew to the point where John Rockefeller singlehandedly represented 1% of the American economy, he still continued to mop the floors at his church every Sunday after the service. He kept this up for the rest of his life. The most powerful businessman in American history scrubbed the ground every Sunday. That’s a hell of a personal attribute that he kept with him. “Rockefeller’s rivals couldn’t afford to compete. He gave them the choice of either joining with him or going under. 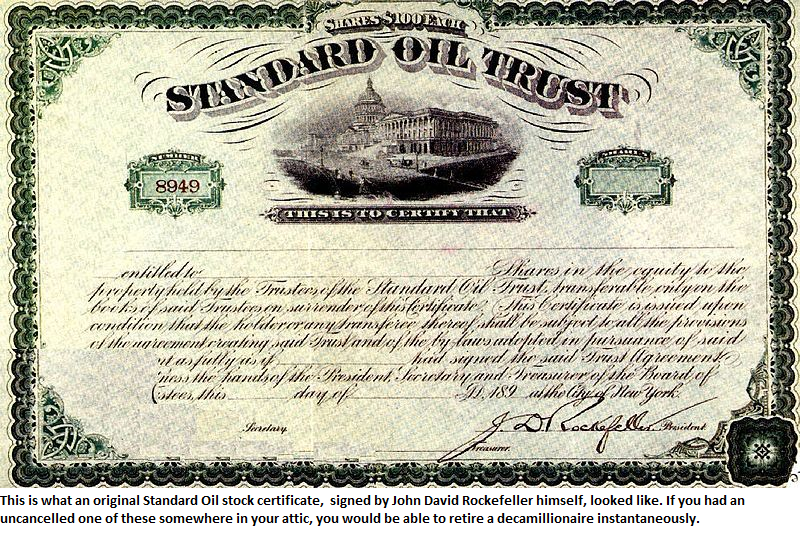 Most added their companies to Standard Oil in exchange for stock. Rocekfeller’s own younger brother, Frank, was one of these rivals. After refusing to give in to John D.’s demands, Frank was crushed by Standard Oil, leaving him bitter for the rest of his life. John’s other brother, William, had the sense to join the business, and he became a multimillionaire. You could see a little bit of both Mama and Papa Rockefeller shine through in John D.’s approach to competing with his brothers. On one hand, he is like his mother in that he gave both siblings an opportunity to join his empire and receive an amount of Standard Oil stock that would lead to lifelong riches. On the other hand, if he did not join forces with him, he regarded you as the enemy that must be destroyed. Blood relation or not. William Rockefeller joined, and he became one of the richest men in America. Frank refused, and that decision wrecked his life. These are the kind of storylines I think about when I see the Board of Directors at Conoco, Chevron, Exxon, and a host of others declare their dividends. Big Oil companies aren’t something that was “always” there. It took one man with an insane focus and drive to pull it all together. It is entirely realistic to conclude that if John D. Rockefeller never existed, the American oil industry would be as fragmented as the water industry is today. The pensions, trust funds, and index funds that churn out oil dividends every quarter owe that income to the insatiable business appetite of John David Rockefeller.